Did you know that today would be Julia Child’s 105th birthday? In honor of the culinary great’s birthday, I joined a few of my blogging friends to cook up some Julia-inspired recipes. Where better, I thought, than to start off by reading Julie and Julia? What a disappointment that was. I really should have researched the book more before picking it up. I naively assumed that the book would chronical more of Julia Child’s life (rather, the author’s narcissistic narrative was abruptly interrupted by an unrelated imagined scene from Julia Child’s younger years). Instead the book followed miserable secretary, Julie Powel in her pursuit to cook all of the recipes from Julia Child’s Mastering the Art of French Cooking in one year. What was meant to be endearing and comical simply wasn’t. Basically, Julie flounders through life hating her job, she claims to be happily married but treats her husband like garbage, and has the housekeeping skills to make most maids turn heel and run. Needless to say, I wasn’t a fan. But what I gleaned from the book was a) what I really wanted was a memoir/biography about Julia Child (this was so not it), b) I want to check out Mastering the Art of French Cooking from the library (it’s always checked out!) and c) butter. It seems that most of the recipes in both books include copious amount of butter, which got me thinking of one of my bucket list recipes: Puff pastry. It’s one of those ingredients that seems to show up time and time again. I feel like I’m constantly passing over recipes that use puff pastry, because I just don’t want to buy the frozen stuff. I don’t know why, but I just don’t like the idea of frozen pastry dough! 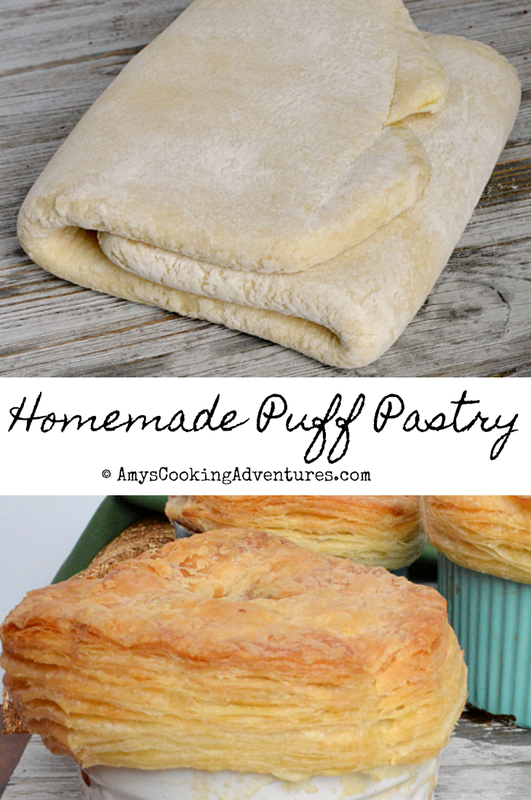 So without even ever having experience with frozen puff pastry dough, I decided to tackle the homemade version! Looking at the recipe, I found that puff pastry dough is actually quite similar in process to croissant dough. In both recipes, the butter is laminated between dough layers. In the laminating process, the dough is folded and rolled over and over again to create hundreds of flaky layers. Eventually, during the baking process, the watery part of the butter evaporates creating the puffy flakiness. The real key to the process, other than ample chilling time, is the butter, which need to be cold, yet pliable. In fact, there is even a special rolling pin that is used for beating the butter into submission. I, however, do not have the magic butter bat. But as I thought about it, the cold yet pliable descriptor reminded me a lot of homemade butter. After cream has been amply beaten to create butter and buttermilk, it is kneaded in ice water to remove and residual buttermilk and it’s cold & pliable. Plus, back when I was researching croissant recipes, I learned that different butters have different fat contents and that for croissants, the higher that fat content, the better. I also learned that most commercial butters in the US are on the lower end of the spectrum, whereas some of the spendier European butters or homemade butter are on the higher end. I used homemade butter in my croissants, and decided to do the same with the puff pastry. I used this particular puff pastry to make some pot pies (I’ll share that recipe later) but just look at those flaky layers!!! Ahhh! What started off at around a quarter-inch puffed up to over an inch tall! Plus, it was soo incredibly buttery and delicious! Puff pastry is a rather time consuming process, but it is totally worth it in the end! Don't miss these great Julia-inspired recipes! Place the flour & salt on a work surface, and mix together. Create a well, and add 1 tablespoon of water, scoop and fluff the flour to mix in the water. Repeat the steps, creating a well, adding 1 tablespoon water, fluffing, & scooping until a shaggy dough is created. Dough is ready when the dough clumps together and holds when pressed together. Wrap the dough in plastic wrap and refrigerate for 30 minutes or more. While you make the dough, place the butter in the bowl of a stand mixer fitted with the whisk attachment. Turn the mixer to high and beat until the butter separates from the buttermilk. Drain off the buttermilk (and make English muffins!!) Squeeze the butter to release any additional buttermilk, then place in a bowl of ice water. Knead the butter in the ice water, replacing water as it becomes cloudy. Once the water stays clear, pat the butter dry and shape into a 4x4 inch square. Refrigerate for 5-10 minutes. Remove the dough from the refrigerator and roll into a 9x9 inch square. Place the butter block off-set in the center (the corners will be at an angle to the corners of the dough). Fold the corners of the dough over and pinch to seal. Liberally dust the work surface, flip the dough, seam side down and roll into a 12x6 inch rectangle. Fold the dough like a letter, flip ninety degrees and roll to 12x6 again. Fold like a letter, then wrap and refrigerate for 30 minutes. Roll to 12x6 and fold like a letter twice more and refrigerate for 30 minutes. Again, roll to 12x6 and fold like a letter twice more and refrigerate 60 minutes or overnight. Roll the dough to ¼ in thick, then use as desired. 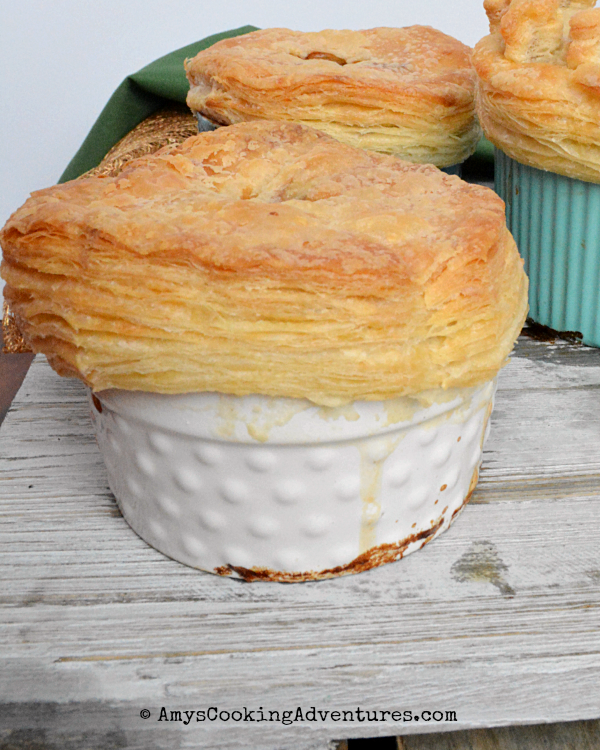 Homemade Puff Pastry rises to new heights and is a delicious addition to the cooking repertoire. Start by making the dough. Place the flour & salt on a work surface, and mix together. Create a well, and add 1 tablespoon of water, scoop and fluff the flour to mix in the water. Repeat the steps, creating a well, adding 1 tablespoon water, fluffing, & scooping until a shaggy dough is created.Dough is ready when the dough clumps together and holds when pressed together. Wrap the dough in plastic wrap and refrigerate for 30 minutes or more.While you make the dough, place the butter in the bowl of a stand mixer fitted with the whisk attachment. Turn the mixer to high and beat until the butter separates from the buttermilk.Drain off the buttermilk (and make English muffins!!) Squeeze the butter to release any additional buttermilk, then place in a bowl of ice water. Knead the butter in the ice water, replacing water as it becomes cloudy. Once the water stays clear, pat the butter dry and shape into a 4x4 inch square. 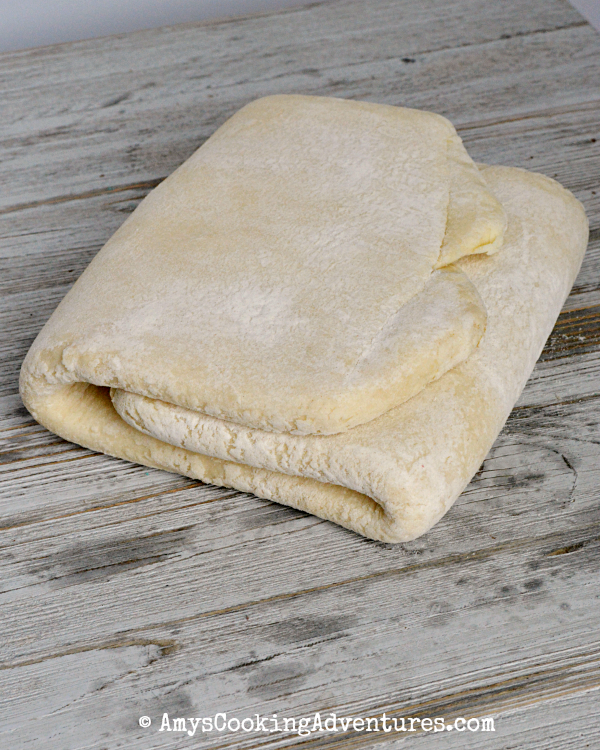 Refrigerate for 5-10 minutes.Remove the dough from the refrigerator and roll into a 9x9 inch square. Place the butter block off-set in the center (the corners will be at an angle to the corners of the dough). Fold the corners of the dough over and pinch to seal. Liberally dust the work surface, flip the dough, seam side down and roll into a 12x6 inch rectangle.Fold the dough like a letter, flip ninety degrees and roll to 12x6 again. Fold like a letter, then wrap and refrigerate for 30 minutes. Roll to 12x6 and fold like a letter twice more and refrigerate for 30 minutes. Again, roll to 12x6 and fold like a letter twice more and refrigerate 60 minutes or overnight.Roll the dough to ¼ in thick, then use as desired. I have made laminated dough for Kouign-Amann, but never thought to make my own puff pastry. 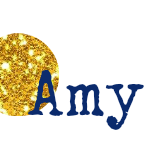 Thanks for the inspiration, Amy. Your puff pastry is amazing! It's been a long time since we attempted this recipe in our home. I'll have to get Steve to make some - he's much better at this than I am. Funny - my experience with the books is opposite. 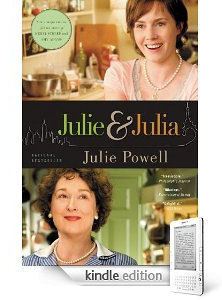 I'd read Julie and Julia long before the movie came out and I was a bit shocked that the movie combined the two books. It would have ben much more satisfying to have it about Julia and her life. I am so sorry you didn't enjoy the book. I didn't read it, but I did watch the movie. I enjoyed it. I have never thought to make my own puff pastry. I will have to give it a try. I bet the fresh is so much better than the store bought! I have been wanting to make this myself for a while now! Yours looks amazing! I read somewhere that it is a time consuming recipe, but I am glad to hear you feel it was worth it! Definitely going to give it a try! I'm super impressed Amy, homemade butter and homemade pastry....you are amazing. I have actually made the puff pastry from Baking with Julia and loved it! I so admire that you made your own butter! Your pies look amazing. Such flakiness! I make homemade puff pastry fairly frequently and ahhh it's so good-I love all those flaky layers in yours!